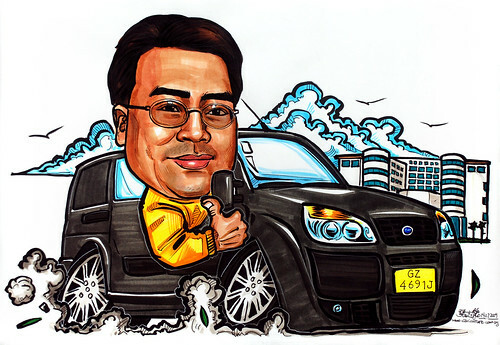 I am impressed by your work and would appreciate if you could do caricatures for my colleague....John Seah who will be leaving the company soon as a farewell gift. 1. He will be in his Fiat grey vehicle with half of his body out, wearing a black jacket. Please indicate the plate number: GZ 4691J. 2. Nanyang Executive Centre building to be on the background. I would want the caricature to be something like the attachment Example 2 (or better)." First time drawing a van caricature.